and even though it all went wrong, i’ll stand before the lord of song with nothing on my tongue but Hallelujah! With nothing on my tongue but Hallelujah! c. 2017 Not to be reproduced or used without author permission. The highs and lows of the week roller-coasted with such a centrifugal force of hormones that a Rite of Passage collided with a Mens Warehouse. I bought The Boy his first suit today for his 8th grade graduation tomorrow. I couldn’t take him before today because he’s been cramming for finals. The Boy is 6 feet tall and weighs 155 pounds. and boasted only 21 inches. I’m gonna have to measure, but I think his left foot now might be longer than he was when he was born. So we walk into this suit place and Matthew comes over to wait on The Boy. The Boy looks at Matthew who’s got style written all over him from his purple tie to his black cowboy boots and gives Matthew the eyebrow. The Boy has very expressive eyebrows that can communicate a derisive snub or an impressed bravo depending on their signature arc. He extended Matthew the thumbs-up eye brow. The Boy was quick to notice Matthew’s accessories too. The thumb ring and hand-hammered, silver slave cuff bracelet earned a nod. Matthew’s hair also met approval, tussled with that just-out-of-bed look that takes 45 minutes and two kinds of product to produce. So as not to mislead you, let me say upfront that our boy is straight. He wasn’t sizing up Matthew, he was making notes as this first suit of his will not only be worn for graduation tomorrow, but also his first formal dance tomorrow night. So I walk in with The Boy whose shuffling in a pair of warped flip flops and a stained pair of PE shorts (he won’t let me toss because they’re in beloved favorites), and he intersects with Matthew whose got some major swagger. That was probably the moment that escalated the shopping trip from one that I knew was going to be expensive to one that got really expensive. Like it he does not. I get him to buy new shoes by throwing out the old pair. Not being able to dress-out for PE motivates him. I expect his classmates think we are on food stamps. That’s The Boy I took into the men’s clothing store today. We’re five minutes into a shopping experience with Matthew and The Boy’s asking for fashion advice. He’s actively discussing purple versus pink as an accent color and which tie best pulls a pattern. We didn’t go in there to buy shoes and he pets a pair on display and confesses to Matthew that he really doesn’t like borrowing his dad’s shoes and that they kind of pinch his pinky toe. Matthew counsels my son on the importance of taking care of his feet as he is an athlete and is gonna need them strong for the field as well as the dance floor. The Boy was almost purring once it came time to pin his pants to hem. He quickly agreed it was worth the initial investment for the perma-crease for his trousers. He and Matthew extolled the virtues of a heavy, cedar hanger for hanging suits and willingly practiced hanging up his own pants so that they would not wrinkle. Matthew explained to him that a man needed to know how to take care of his own suit without the help of mom. To his credit, The Boy knew who held to the American Express card and gave me a look. It was the I-love-you-aren’t-I-adorable-I’m-your-boy-eyebrow. He puts his arm around me after the eye-popping tally hits the credit card voucher and opines that he really doesn’t mind if I chaperone the dance. We return two hours later to pick-up his altered suit and pressed shirt. He greets Matthew with this complicated handshake-slap routine I can’t imagine where he learned. Matthew leads him to a fitting room to try his suit on and it happens. that needs no thumb ring. the camera loves Brad Pitt. My eyes blur as I watch my boy see himself and like the man he sees. The May dance Here jigs a dervish as frantic as the one I recall and trust that you are also doing There. It’s an aerobic month that demands inventory and industry with more than a dash of insanity. With no end to the list of things I gotta do, my children also scramble to meet their many, various objectives. They have academic jobs, social obligations, domestic chores, athletic responsibilities and personal agendas. They gotta do so much more than was ever expected of me at 6, 10, 12 or 14. In many ways, their I Gotta Lists are longer and less yielding my own. while the rest of his siblings leisurely unfold into Summer mode collide two fronts as forcefully as a hurricane. Their howls, cries, complaints, and frustrations register enough MPH (Moans Per Hour) to be classified as a Category 4 event. It is also simultaneously a season of turning each other in, spontaneous confessions and hypersensitive peer relations. In this merry ‘ol month of May, I never know at any given moment which child will come to me with moist, wide eyes and, “Need to talk to me alone.” Generally, there are tears and we have to hug it out before things resolve. The school year has tenderized their egos like a gourmet marinade and the Crying Chair hasn’t gotten this much use since we moved in. As a Mamma, I’m something of a hybrid between an attachment parent and a drill sergeant. I am crazy in love with my wonderful children, but I get that they are no where near perfect and often need a combat boot kick to jump start their quality maneuvers. I am also aware, however, that their I Gotta lists demand almost every moment of their waking hours. Their obligations have begun to blister them like their now almost too small shoes I bought them for Back to School in August. They are rubbed raw by the deadlines, award banquets, concerts, and games. They can not perform at a concert and play in a soccer tournament at the same time. They can’t study for an Algebra exam and practice an 8th grade class speech in tandem. Though helpful to an extent in terms of teaching time management skills, too often our kids face Hobson Choices between two required events. Does this help them better organize their time or polish their study skills or simply assert that many students are overbooked? What strikes me as most unfair in this merry old month of May is how unrealistically our children are taught to adhere to the rigid (and often unreasonable) timelines of their I Gotta lists. As an adult, I have options that are unavailable to our children. I can pull an all-nighter. I can file for an extension, or sometimes pay for an extension. I can decide not to do it. At their school, my children would be suspended if they outsourced, consequenced if they winged it and have no option to delegate their I Gotta lists. As a mom, I also have options my children lack. I can not do it. I can reduce the usual requirments. I can do it tomorrow without penalty. In our home, my children would lose a cherished, electronic device if they went on strike, sent to Time Out if they didn’t do something, “The right way the first time,” and have zero delegation options. As we sprint through this month with so much to do and so many places to be, let’s consider that even within our families, our I Gotta lists ain’t really equal nor created the same. My children need Grace, the Crying Chair and the boot right now. And they’re in good company. Why do people say that? What sense does it make? The underlying assumption slaps the I’m right assertion with a heavy hand. Its backhand hits on the recoil, <subtext> and if you’re not like me you’re stupid. It offence blisters my sense of whimsy and chafes my authenticity meter. Furthermore, there’s no appropriate rejoinder to dissent such an assertion without giving offense. How am I supposed to respond? It’s all so very, order-your-own-dessert-if-you-want-cheesecake-dammit-I-don’t-want-to share-of-me, but really, how can anyone be like you in that way? That drives me bat cakes too! Again, I don’t want to sound contrary nor offend, but no, I don’t want to share the Meatloaf Plate with you. Actually, I want to choose my own meal, get it on my own big-girl plate, eat how I want of it precisely to my fill, and hog all of the gooey condiments for myself, thank-you very much. If you knew me well enough to tell me something so potentially volatile, you would know how to tell me without making me mad. I smell judgement all over the statement too. It asserts that I assassinate messengers and lack self-control. I need to tell YOU something, but don’t get mad. You’re an idiot. One, you don’t hate to tell me at all, in fact you’re breathless from having rushed over right after you heard it to dish it to my face, capture my every micro-expression on your smart phone, and report back to your base ship. Only pain fills the pail of that conversational bucket. You don’t find it just a tad bit above your pay grade to assess the legitimacy of my emotional range? Of course, then I could tell him, if you’re like me, there are other phrases that make you mad because you’re like me that way. We should share some buffalo wings and discuss it so you can calm down. Said party promised that a stretch Humvee limo would pick up each 8 year-old princess for a luncheon at the Bistro, a five star “dive” on the beach. After lunch, their Humvee pumpkin was to ferry them onward for a shopping expedition. Each guest was given a $100 Visa gift card within a new Coach wallet to spend on their mall outing. Night-night would include room service popcorn and root beer floats for the girls in their Princess Suit with resort nannies. After a quick peck good night, the mommies would head downstairs where the limo would await to wisk them off to the “Hot Spots,” on the beach. Breakfast buffet to follow on the beach the next morning served from 9-11 a.m. Check-out would be at noon when the girls would be taken home via Humvee stretch. Engraved invite motto for the Princesses: One need not be born royal to have Princess fun! “A little over the top, don’t you think?” my BFFH asked me. “Ya think?” I chortled, as we continued to jog the park, me in my hand-me-down Nikes and Good Will tennis skirt. Yes, I am absolutely crazy. In fact, I’ve taken to describing my current cognitive condition as a non-concussive brain injury. Nothing hard or large hit me on the head, but I am nonetheless operationally impaired. My never great, short term memory is now completely shot. Like I can’t remember my children’s names shot. Never mind their birthdays, they always remind me of those anyway. Where as a recent CAT scan would prove my brain is physiologically intact, the road from the driveway There to the driveway Here cost me at least 59 IQ points. They promise me it’s temporary. I operate like a brain injury patient who’s run away from her rehab facility. And the laundry. My physic wounding has also deleted my laundry function capacity. We live in a sea of dirty clothes piles. The children don’t even expect I’ll get their PE uniforms back to them in a timely manner. They taken to wearing them dirty and using lots of deodorant and body spray. Some of you have seen this dysfunction in action, or should I say inaction? Again, however testily queried, thank-you for asking, and trust I admire the emotion behind your multiple use of the exclamation point and question mark/exclamation point combo. We did, in fact get the kids a puppy for Christmas. 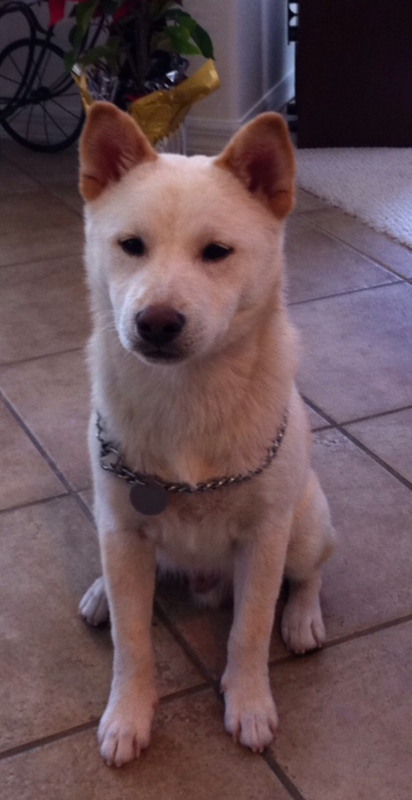 He’s of the smallest of Japanese breeds, Shiba Inu, and his name is Hoshi. Hoshi is the Japanese word for star. He is our widdle, shiny Christmas star. Hoshi fulfills a pre-relocation promise The Husband made to the children. Much like Obama, The Husband vowed our babies would get a dog if we came to live in this little ,white house in Far Far Away. Hoshi flashes us back to past years with newborns complete with nocturnal crying, potty explosions and scheduled time for tummy play. I understand why you would ask if I was in my right mind to introduce a puppy into our transitional mix, but I already admitted that I’m really not. Please leave your ideas as comments! We want to be safe. broken hallelujah is powered by	WordPress 4.9.8 and delivered to you in 0.436 seconds using 35 queries.